Gunter's wildflower honey comes from blossoms of wildflowers, brambles and trees. It is usually a medium to medium-dark honey. Use it as a general use darker honey cooking. An excellent honey for coffee or black tea. Brush it on as a finishing glaze on grilled pork. Warnings Do not feed to infants under 1 year of age! Gunter's Wildflower Honey - 5 lb. 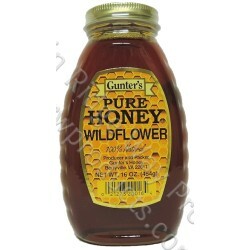 Gunter's Wildflower Honey Bear - 12 Oz. Net Wt.